A dog attacked a 40-year-old man in a backyard in Daly City Monday morning, leaving him in critical but stable condition, police said. Mark Matthews reports. 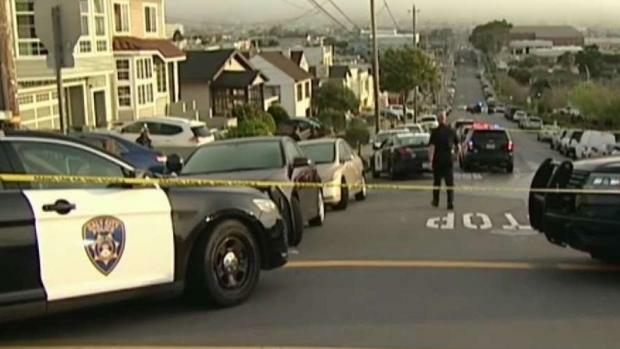 A dog attacked a 40-year-old man in a backyard in Daly City Monday morning, leaving him in critical but stable condition, police said. The attack occurred around 7 a.m. along the 900 block of Schwerin Street, according to police. After arriving at the scene, officers spotted the dog attacking the man, police said. Fearing for the injured man's safety, officers shot the dog, killing it. Circumstances leading up to the attack were not immediately known. It's also unclear if the man lives at the residence where the attack occurred. A dog attacked a 40-year-old man in a backyard in Daly City Monday morning, leaving him in critical but stable condition, police said. Sharon Katsuda reports. Police said investigators were interviewing the owner of the dog late Monday morning. Neighbors who witnessed the attack reported hearing yelling before they looked over their fences and saw the dog attacking the man. Neighbors said they tried to help the man, but they were limited by the height of their fences. "We couldn't get to him," Patricia Ochoa said. "We were trying with the hose. The guy, he asked me to throw him a knife. I threw him a knife. He couldn't stab the dog because his arm was too weak." The man was taken to a hospital after being treated at the scene, according to police.